NB: The Japanese initially listed this camp as being part of the "Zentsuji" group of camps. See the camp group history for more details. Both ways of pronouncing MUKAIJIMA and/or MUKAISHIMA are correct. Japanese is inconsistent in this regards. The character for "island" by itself is always pronounced as SHIMA, but stick it on the end of another character and it changes sometimes, e.g. Hiroshima is not pronounced Hirojima, and Iwojima is not pronounced Iwoshima, nor is Sakurajima pronounced Sakurashima, etc., etc. There is no rule for this. Interestingly, to add more to the mix, Iwojima is now pronounced Iwoto in Japan, "to" being just another reading for the kanji "shima." 22 Oct 1942: 2500 POWs depart Tanjeong Priok (Port of Batavia) on Yoshida Maru. 7 Sep 1944- 116 Americans arrive from Philippines on the Noto Maru. There were over 90 prison camps throughout Japan, and about 32,000 prisoners of war in all. 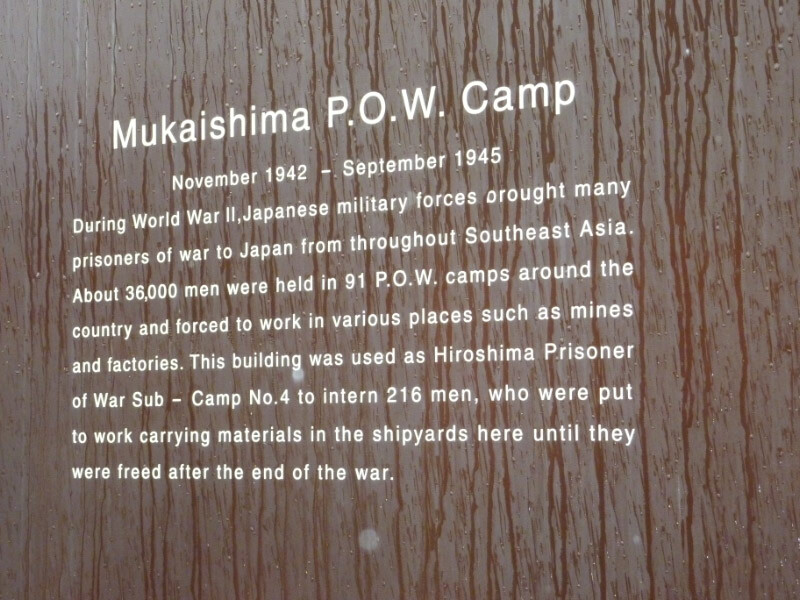 Here in Mukaishima, the Hiroshima Prisoner of War Sub-camp No.4 was set up and the number of prisoners of war, including British and American men, totaled 216. First, in November 1942, 100 British airmen were shipped from Indonesia to Mukaishima on the Dainichi Maru, and put to work in the shipyards. Of these, 23 men died. Later, in September 1944, 116 American soldiers came up from the Philippines on the Noto Maru, and at the end of war all of these returned to their home country (one American died). Memorial Plaque 1 - Memorial Plaque 2 (courtesy of Terry Smyth) The old building was demolished in order to build a supermarket in 2012 -- the plaques have been relocated nearby (see street view). Americans: 100 came from Noto Maru and arrived 7 Sept 1944, majority of men from theNichols Field Detail; Guam men had arrived at Zentsuji on the Argentina Maru (Jan 1942). 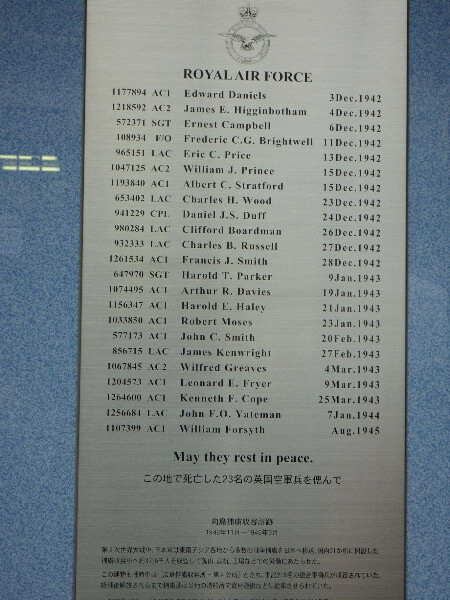 American Roster - Source NARA RG 407 Box 103 plus confirmation of name on photograph; 118 men plus one deceased. Special: John Ovens BBC Interview. Notes that he was sent to Australia for several weeks of convalescence (via carrier HMS Ruler) thence flown home to England. Japanese school in Mukaishima honors the men of this camp. Developed under the guidance of Koshi Kobayashi. Very detailed and well done. About 1/3rd down the page are group pictures of men on the beach before the rescue. 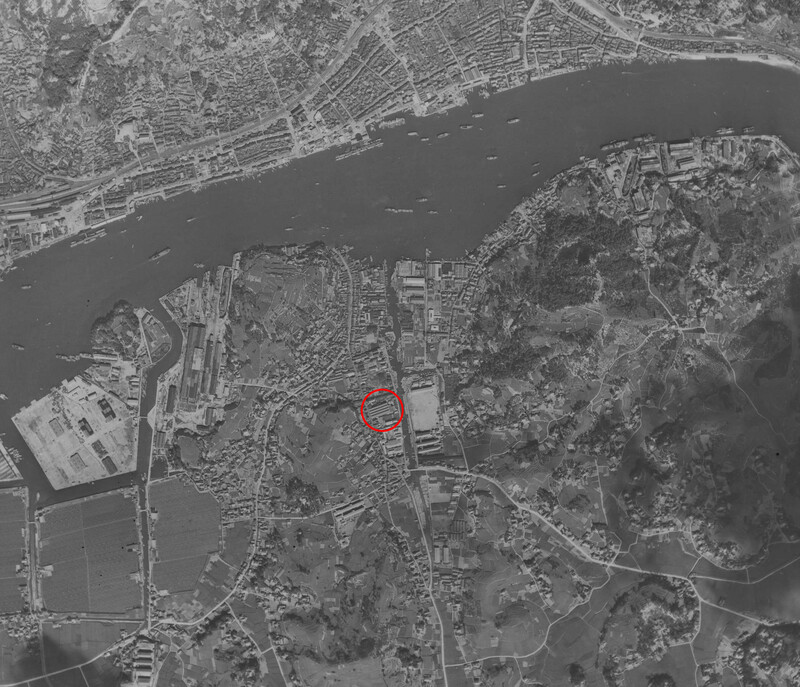 Excellent diary detailing Tanagawa and this camp- while known at Fukuoka #11. Special article regarding Pvt Edwards testimony against fellow American at Courts Martial. Navy man, Hirshberg, accused of collaboration and beatings of fellow Americans. Further info in this PDF file re trial. Allied POWs at Hiroshima and Nagasaki. Aug. 8, 1945, B-29 (#42-63612, nicknamed Nip Clipper, 313BW, 9BG) crashed in the Sea of Japan 60 km east of Iki Island, Fukuoka-ken. Mission No.319 (Target: Yahata urban area. 245 B-29s sortied from 58BW, 73BW and 313 BW, and four were lost). The plane seemed to have become a victim of flak. 2/Lt. George F. KELLER (A/C) bailed out, but chute did not open and was killed. Ten crewmembers, 2/Lt. Walter R. ROSS, 2/Lt. Stanley H. LIVINE, 2/Lt. Carleton M. HOLDEN, 2/Lt. Eugene V. J. CARRELL, M/Sgt. Selby L. FOWLER, Sgt. Martin L. ZAFPE, Sgt. Gerald J. BLAKE, Sgt. Robert M. CONLEY, Sgt. Christas NIKITAS and Sgt. Traver HERMAN, bailed out and landed in the sea. On Aug. 14, while they were drifting in rubber rafts, a fishing boat rescued them off Takashima, Kamate-mura, Mino-gun (present Masuda-shi), Shimane-ken, and took them to Ohama beach. On Aug. 15, when they were on their way from Masuda railway station to Yamaguchi Kempei Tai, the war was over. After they were sent to Chugoku Kempei Tai HQ on Aug. 16, they were moved to Mukai-jima branch of Hiroshima POW Camp, whence returned to the US in September. Walter R. ROSS revisited Hiroshima in 1983 and published a book “Courage Beyond The Blindfold - The Last POWs of WW2” in 1995.